The Digital Research Library of Illinois History Journal™: The Eads Bridge is the world's first steel-truss bridge and an engineering marvel spanning the Mississippi river between East St. Louis, Illinois and St. Louis, Missouri. The Eads Bridge is the world's first steel-truss bridge and an engineering marvel spanning the Mississippi river between East St. Louis, Illinois and St. Louis, Missouri. 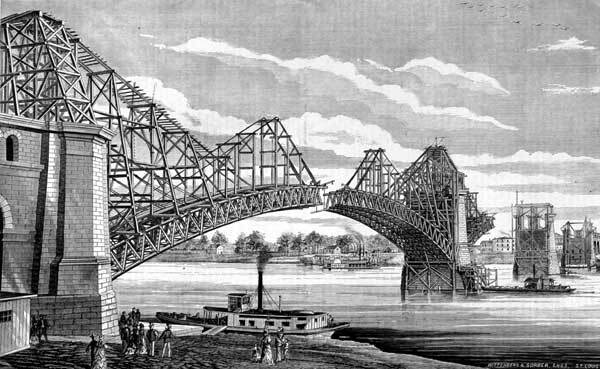 After the Civil War and the expansion of the nation's railroad system, it became apparent that for St. Louis (the Gateway to the West) to survive, a bridge across the Mississippi River was essential. In 1867, the St. Louis Bridge and Iron Company, made up of a group of City bankers and businessmen, hired James Buchanan Eads (1820-1887) to build one. Eads was a self-educated engineer and had never built a bridge before. But during the Civil war, he had been called on by Washington to construct several Ironclad gun ships and completed his contract in an incredible 65 days. 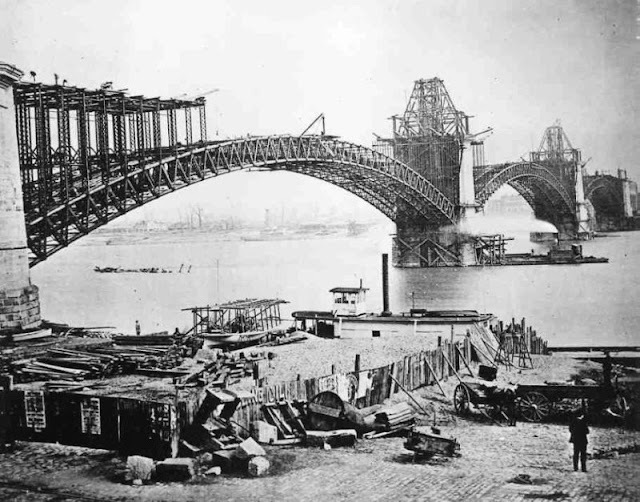 The construction of the bridge began in 1867. Giant granite-faced piers support three graceful arches and two decks. Eads Bridge was the first bridge to carry railroad tracks, the first to use tubular cord members and the first to depend entirely on cantilever construction for its superstructure. Pneumatic caissons were used for the first time in the U.S. in the construction of its piers, which were sunk to the unprecedented depth of 123 feet. This new design is a testament to Eads' brilliance as an engineer, but it is also evidence of the grueling fight that the builders had to wage against the ferry and shipping interests. These powerful companies had controlled the crossing of the Mississippi since Capt. James Piggott started the first ferry across the river in 1795. His company sold out to the Wiggins Ferry Company, who came to dominate the riverfront on the Illinois side of the river. These interests lobbied for restrictions and specifications on the height, construction, and span of the bridge that they thought could not be surmounted by any engineer. Unfortunately for them, James B. Eads was one of the best engineers of his age and he found "work-arounds" for all of their artificial obstacles. The Eads bridge spans the Mississippi River between East St. Louis, Illinois and St. Louis, Missouri. At 6,442 feet long, it was the longest arch bridge in the world. It first opened to foot traffic on May 29, 1874. 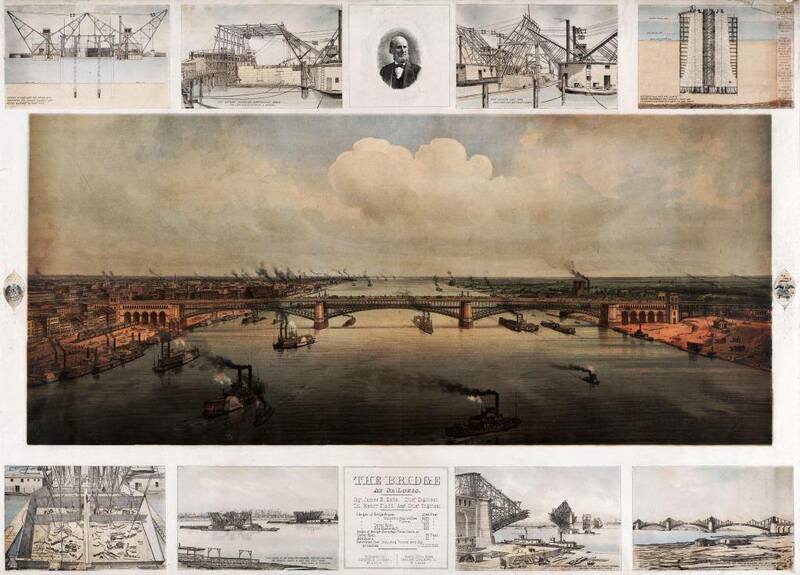 This chromolithograph shows the construction of the bridge and the finished product as it would have looked in 1874. It was published by Compton and Co. in St. Louis in 1874. The bridge was completed for a cost of nearly $10 million, and dedicated on July 4, 1874. In recognition of this unparalleled engineering achievement, Eads Bridge was named a National Historic Landmark, the highest designation given by the National Park Service, in 1964. 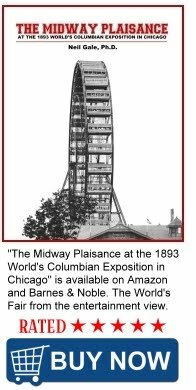 It was made a National Historic Civil Engineering Landmark by the American Society of Civil Engineers in 1971 and designated a City Landmark the same year.